Weber tuning for me! This is how I do it. Many tuning problems are due to an incorrect ignition timing or spark plugs. Don't forget the ignition leads. Also, always check the carb rubbers and the hoses for the petrol for leaks before adjusting the carbs. Check the FUEL HOSES for cracks (especially near the ends) or leaks. Replace them if they look too bad. Empty the water separator and inspect or replace the FILTER. Now, check for FULL THROTTLE OPENING. Have a helper step on the accelerator pedal while you watch the throttle shafts rotate to the fully open position. Gently adjust the linkage, if necessary. Make sure that the bellcrank under the carbs is not sticking on its shaft. Remove some fuel from the carbs and let the engine idle for two minutes. Remove the wingnut caps. Then, use the depth gauge end of vernier caliper to measure from the top of the lower shelf to the top of the fuel surface. DCOE spec = 1.14 inch (29 mm+4.5 mm). 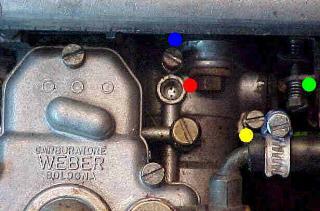 If the depth is NOT correct, the top plate of the carburetor must be removed. Carefully bend the tab on the float assembly that touches the needle valve. Reassemble and test the float level as before..
Raise the idle speed to 1000-1500 rpm by turning the Idle Stop Screw. It does not matter if the rev counter is accurate as long as you keep a steady reading. Remove the spark plug wires from the two rear spark plugs and ground the wires. Turn each of the front two Idle Mixture Screws clockwise and count the number of turns until the Idle Mixture Screw touches its seat. Normally, this screw is about 3/4 of a turn from its seat. Adjust the two front idle mixture screws so that the engine rpm is the highest possible. Allow a few seconds after each adjustment for the engine to respond to the change. Stop the engine. Reconnect the two rear plug wires and disconnect and ground the two front plug wires. Adjust the two rear idle mixture screws. NOTE: The idle speed should be the same when the engine is running on the front two or on the rear two barrels. Stop the engine and reconnect the wires. Turn the Idle Stop Screw clockwise to the original position. Adjusting the IDLE SPEED. 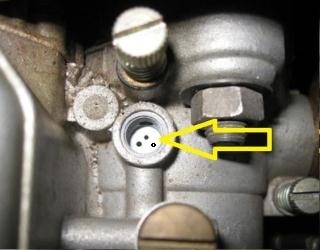 Adjust by turning the Idle Stop Screw. If the idle is too high when the Idle Stop Screw is NOT touching its seat, the throttles are NOT returning to the closed position. Make sure that the linkage is not binding.